Forested land in the eastern United States is owned by a complex mix of public and private owners, often with highly varied objectives and uses. There is an increasing trend at local scales of community forestry programs that use community-based decision making to determine what type of management will occur on town-owned forests. Within the suburban town of Weston, Massachusetts, this type of coordinated approach has been ongoing for nearly 4 decades. This article describes the integration of forest ecology and management research, including a forest inventory and long-term monitoring program, to educate townspeople about their forests, engage students in ecological research, and provide data that the town can use to make informed management decisions. 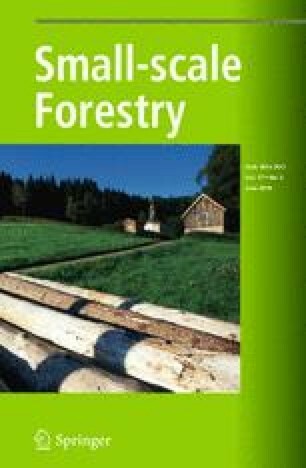 This article presents a novel model for a research-based community forestry program, results from the first inventory and plot measurement period, and describes how other towns can use this type of program to supplement existing active forest management, or provide a baseline for future management. Results are applicable to municipalities that own forest land, as well as land trusts or other private entities that wish to manage their forests using a community based forestry model. We would like to thank Brandeis University and the Harvard Forest for institutional support during the research process. This work was made possible by a grant from the Baker Foundation and support from Highstead. We would like to thank members of the 2010 and 2012 Environmental Field Semesters at Brandeis University for assistance with field work, and the staff of Land’s Sake for their continued work to sustainably manage Weston’s forests. Finally, we would like to thank Michele Grzenda and members of the Weston Conservation Commission for their continued engagement in forestry and research in Weston.